Public perception about the so-called “Global War on Terror” is manipulated in various ways by a trail of misinformation and disinformation. This article is a case study on the October 22, 2014 lone gunman rampage of Parliament Hill in Ottawa that was used by the government of Steven Harper to justify the Canadian entry into the US war in Iraq and, later, the US-led war on Syria. Despite being proven otherwise, the attack by Michael Zehaf-Bibeau was reported as being linked to the so-called Islamic State in Iraq and the Levant (ISIL/DAESH/ISIS/IS). On the day that Michael Zehaf-Bibeau went on his rampage, a tangled web of information was erected. In all the reporting by the media, the sources were lost. What resulted from this was the perception that Canada was under a foreign-planned attack led by the ISIL/DAESH. One important source, @ArmedResearch, a US-based Twitter account that presents itself as a microblog for military studies, claimed that the Ottawa attack on October 22 was connected to an attack which took place two days earlier at Saint Jean-sur-Richelieu, Québec (October 20). According to @Armed Research, Martin Couture-Rouleau (who called himself Ahmad LeConverti, which means “Ahmed the convert” in French), who was behind the Saint-Jean-sur-Richelieu car ramming attack, and Michael Zehaf-Bibeau were in some way connected. Couture-Rouleau had killed a Canadian soldier two days before Zehaf-Bibeau went on his rampage on October 22. Presented subsequently in various media reports, the two incidents were said to be interconnected. They were portrayed as a coordinated and orchestrated attack. 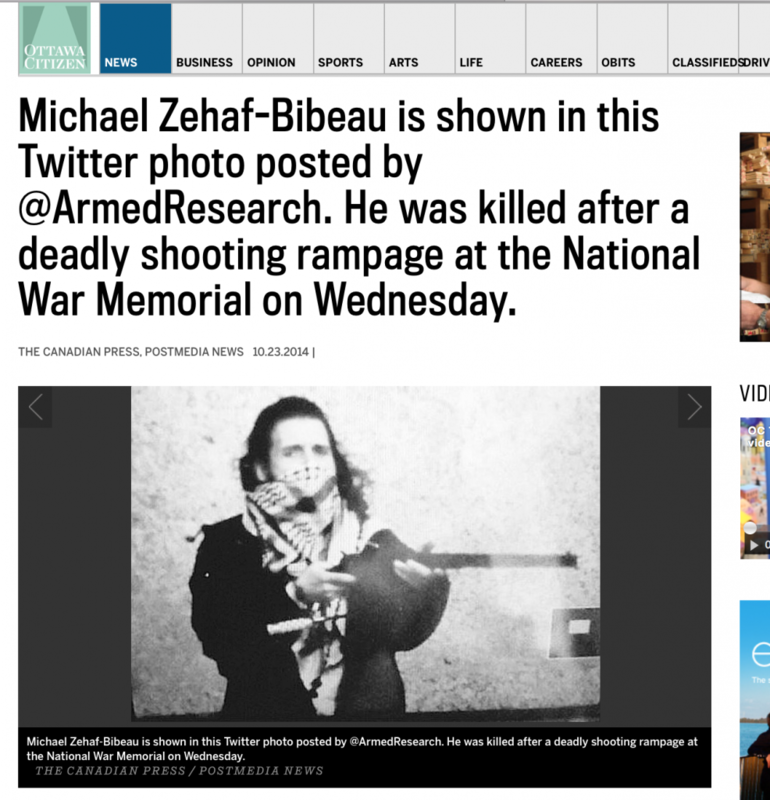 Additionally, the same Twitter account which posted a picture of Zehaf-Bibeau at the Canadian National War Monument starting his rampage within hours of the attack in Ottawa, namely @ArmedResearch, claimed that the photographs came from an ISIL/DAESH source. These were the first pictures of Zehaf-Bibeau and were widely reproduced by the Canadian and international media. Complicating the matter is the existence of another Twitter account, @V_IMS. @V_IMS which was reported to be an ISIL/DAESH account. Ottawa Citizen journalist Shaamini Yogaretnam reported on October 23 that @V_IMS was suspended within an hour after it began circulating the same pictures. Maybe it was because most of the entries and posts on @Breaking3zero were in French and @ArmedResearch could not understand, but what Heavy.com claimed was categorically false. The person behind the post was French-Canadian writer William Reymond. 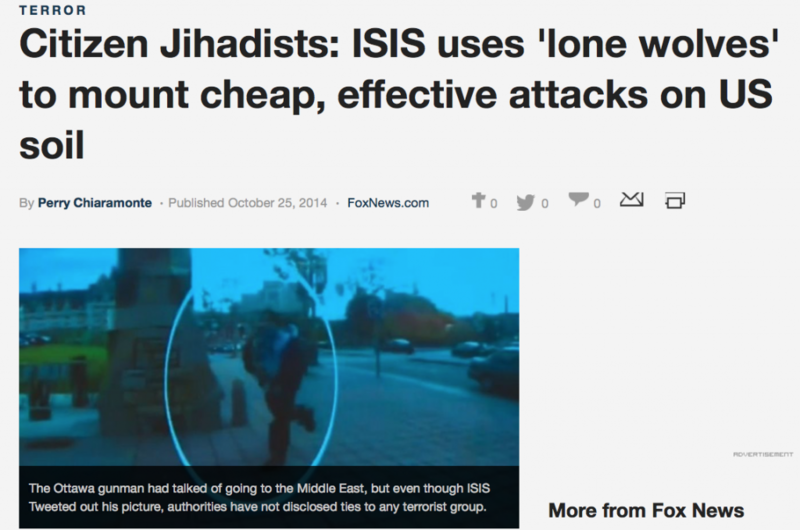 On October 25, Reymond even sent a Tweet message to Fox News about its faulty reporting in a Fox News article misleadingly titled “Citizen Jihadists: ISIS uses ‘lone wolves’ to mount cheap, effective attacks on US soil” by Pierre Chiareamonte. Take a good look at this photo. If you haven’t seen it yet, you’re bound to come across it in the next couple of hours. This picture is going around the world right now. 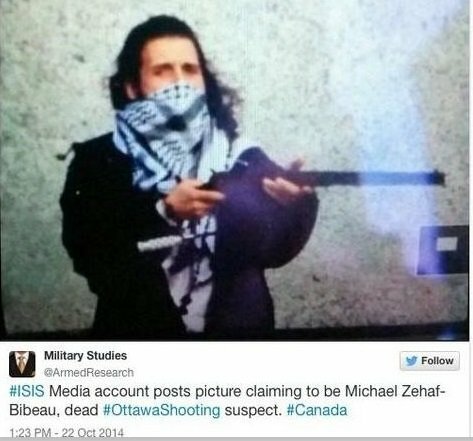 It shows Michael Zehaf-Bibeau during his attack in Ottawa. This photo was first published and identified on my 100% news twitter feed @Breaking3zero several hours before the traditional media got ahold [sic.] of it. I want to tell you the story behind this picture. How it landed on my computer screen and how I was able to identify it before sharing it. The following day, the RCMP told the public they did not know who could have taken the picture of the incident. This kept Canadians in suspense and made them wonder if the ISIL/DAESH had really been behind the attack. It was later revealed that the source for the photograph was the local Ottawa Police Services. Around 2pm, one of my followers informs me of its existence, asking me if this really is the shooter. At this point in time, information on the Ottawa attack is still very vague and contradictory. My first reflex is to ask him about the source. He points to the responses to a tweet posted by the Ottawa police. Not just any tweet. But a tweet asking the witnesses of the attack to share with the police any information allowing to identify the shooter. And there, among the first responses, is the photo of a man holding a rifle. Don’t bother looking, this tweet doesn’t exist anymore. It was deleted almost instantly. Posted from an anonymous account and for just a few short moments, this picture found itself in the huge virtual haystack called Twitter. Whatever the reason, thanks to a screenshot, I find myself with a copy in hands in the early afternoon. The media and news agencies have failed to even correct their mistakes. Instead they have just moved on, leaving many Canadians in a blanket of ignorance and misconception. Many Canadians still believe that the photograph of Zehaf-Bibeau was released by the ISIL/DAESH when in reality it was a photograph taken by an Ottawa police constable using their Blackberry cellular telephone to replicate an earlier photographer taken on the same day by the camera of a tourist at the National War Monument. At its worst, the failure of the mainstream media to report the facts is intentional. At its best, it is the negligence of sloppy journalists and media outlets. Whatever the case, it is malfeasance and a form of misconduct that has misinformed the public about the reach of the ISIL/DAESH and the danger that the public faces. 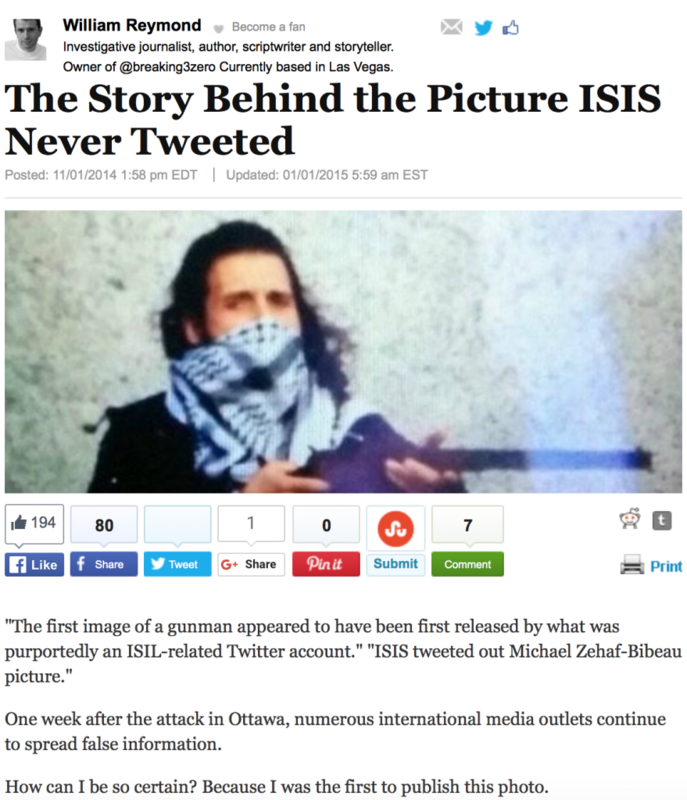 The RCMP also misrepresented the facts, because it reported that Zehaf-Bibeau was planning on going to fight in Syria. He was never planning on going to fight in Syria. The RCMP made this claim, saying that its source was his mother. She, however, angrily spoke out and said that she had even asked the RCMP to correct their mistake after they made the claim. There is an echo chamber of misinformation and disinformation where misinformed reports and conjecture feed other reports, leading to the construction of a distorted picture of the news and world. After a Globe and Mail article on the day of the attack speculated that Zehaf-Bibeau’s adopted father appeared “to have fought in 2011 in Libya,” it was reported as a fact in other media, including the state-owned British Broadcasting Corporation. US law enforcement officials also released information about Zehaf-Bibeau before Canadian law enforcement officials did. This includes the release of his widely circulated picture from the day of his rampage on Parliament Hill. “The working Ottawa police theory is that the photo, regardless of where it first appeared on Twitter, was shared not just internally but with other law enforcement agencies and may have been leaked by police outside the country,” according to Yogaretnam. 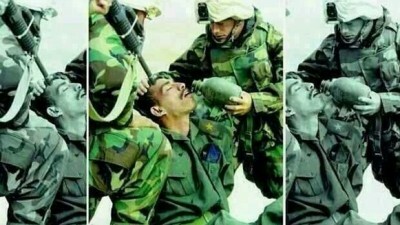 Governments and a cross-section of the mainstream media are societal actors that have what can be described as “role setting agendas.” In other words, both governments and their affiliates and allies in the mass media are involved in branding campaigns that manage societal perceptions. This includes the deliberate creation of hysteria and panic, which is why there was a fixation on the Saint-Denis and Bataclan attacks (November 13, 2015) in France while the terrorist attacks on Beirut’s southern Dahiyeh area (November 12, 2015) that took place a day earlier were virtually ignored. These branding campaigns have been at work to sell specific perspectives aimed at framing or re-framing the views of the public and the way that audiences understand or perceive the policy shifts in national security and foreign policy that justify war and the looting of national resources. It is within this context that it should be noted that the Canadian media has decided to focus on the case of an underage boy from the Lachine area of Montréal being found guilty in 2015 of committing terrorist-related crimes (for robbing a store when he was fifteen in October 2014 and trying to use the credit card of his parents to fly to Turkey to join the ISIL/DAESH in February 2014) while the Canadian government sells massive amounts of weapons to the Kingdom of Saudi Arabia. The focus and gaze of the public is being misdirected towards a misguided schoolboy through an illusion that ignores the real backers of terrorism. Aside from being an oppressive dictatorship, major violator of human rights, and committing war crimes against the people of Yemen in an aggressive bombing campaign, the Saudi regime is undeniably supporting the ISIL/DAESH and other terrorist organizations in Iraq, Syria, Lebanon, and Yemen. Here lies the irony. While an adolescent Canadian schoolboy is being jailed as a terrorist threat for foolishly wanting to join the ISIL/DAESH or other terrorist organizations fighting in Syria and Iraq, the Canadian government is actually supporting and arming Saudi Arabia, one of the widely recognized backers of the terrorists that Ottawa itself claims to be fighting inside Iraq and Syria. Click here to read a detailed analysis of how the Canadian government of Prime Minister Stephen Harper misled Canadians in 2014 about the attack on Parliament Hill while it was being blamed itself for supporting the terrorists inside Iraq and Syria.